The market’s favorable momentum in recent days is likely not a reflection of its happiness with corporate earnings reports, but rather a result of optimism about some of the macro worries that weighed on sentiment in the last quarter of 2018. This doesn’t mean that Q4 earnings results are bad; they are not. But rather that they aren’t so good that the market would be cheering them. We probably shouldn’t get too definitive in our conclusions about the Q4 earnings season at this stage. After all, we have seen results from only 11% of S&P 500 members and the sample of results at this stage is weighted towards the Finance sector. The Q4 reporting cycle ramps up materially this week, with another 56 S&P 500 members representing all the major sectors coming out with quarterly results. Here are the key takeaways from the Q4 earnings season after seeing results from 55 S&P 500 members through Friday, January 18th. Total earnings for the 55 index members that have reported are up +16.9% from the same period last year on +9% higher revenues. 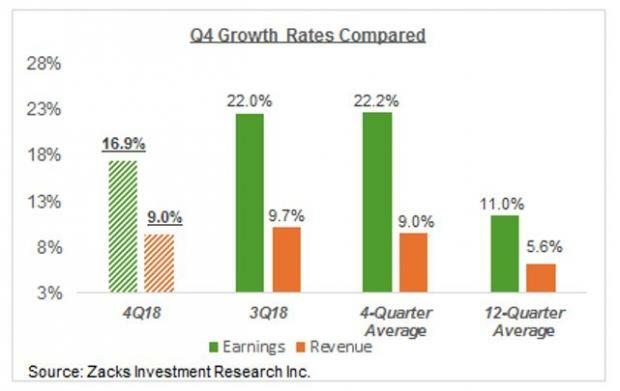 Earnings and revenue growth for the same cohort of companies had been +22% and +9.7% in the preceding earnings season. The comparison chart below puts this growth deceleration in a historical context for these 55 index members. Second, positive surprises are hard to come by, particularly on the revenues side. For more details about the overall earnings picture, the Q4 earnings season and expectations for the coming periods, please check our weekly Earnings Trends report. The good news is growth estimates have dropped even for stalwarts and I think the market understands more the coming quarters that pricing power will determine companies success in the future more than phenomenal sales growth. This is probably bad for the slew of money losing start ups the street keeps dumping into the market. However, they do this because some are obviously willing to gamble with them. Casinos will stay open as long as their are gamblers willing to bet on losing propositions. Investing in startups is just another form of gambling. But that involves more than pure luck. If you invest in the right ones, it will pay off.